catechins. It accounts for 9-13% of green tea in net weight. 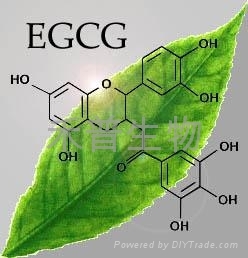 By virtue of its peculiar stereochemical structure, EGCG possesses much stronger anti-oxidant activities and plays an important role in preventing from cancer and cardiovascular diseases. In addition,it is potently used as the reversal agent of MDR (Multidrug Resistance), which may improve the sensitivity of the cancer cell to the chemotherapy drug and reduce the toxicity on the heart. associated with antioxidant, antitumor and antimutagenic activities. The antioxidant activity is at lest 100 times effective than vitamin C and 25 timeseffective than vitamin E at protecting cells and DNA from damage which are believed to be linked to cancer, heart disease and other potentially fatal illnesses. The biological benefits of EGCG are generally attributed to their antioxidant activity to scavenge free radical oxygen. epigallocatechin (EGC), epicatechin gallate(ECG), epicatechin(EC), gallocatechin gallate (GCG), catechin are major catechin of green tea catechin. 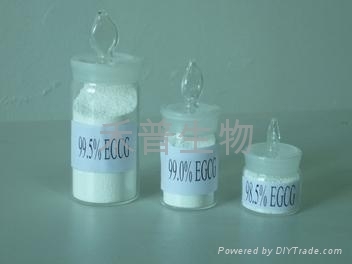 The antioxidant activity increased in the following order: EC<ECG<EGC<EGCG. combats the effects of pollution, sunlight and smoking, helps skin from wrinkling and aging.